As the early transfer of power in Iraq occurred, Americans expressed some optimism about life for Iraqis. Even though less than a third thinks the Bush Administration has a clear plan for the handover, Americans are willing to have U.S. troops to be stationed in Iraq as long as it takes that country to become a stable democracy. They clearly see the U.S. as having a responsibility there. But underlying those positive feelings are doubts about one of the central justifications for the war -- that it was a major part of the war on terror. Many Americans express serious concerns that the war in Iraq has increased, not decreased, the number of terrorists and made the terrorist threat against the U.S. worse, not better. Americans remain divided as to whether invading Iraq was the right thing to do, and most think the war was not worth its costs. And just 36 percent approve of the way President Bush is handling the situation there. In last month's CBS News poll, a majority of Americans doubted the transfer of power in Iraq would occur, and few thought the Bush Administration had come up with a clear plan for doing so. That view persists in this poll: in the days leading up to the handover, most Americans felt the Bush Administration had not yet come up with a clear plan. 30 percent thought it had, but far more, 51 percent, thought it had not. DOES ADMINISTRATION HAVE CLEAR PLAN FOR HANDOVER? The poll was conducted June 23-27, just before today's surprise early transfer of power. Most Americans see the U.S. as having an obligation in Iraq that they are willing to fulfill, and few think the U.S. ought to cut and run after Iraqis take control of their country. 66 percent believe the U.S. has a responsibility to make sure Iraq develops into a stable democracy, while 27 percent think it does not. DOES U.S. HAVE RESPONSIBILITY FOR DEMOCRACY IN IRAQ? To that end, the public is willing to station U.S. troops in Iraq as long as it takes. 54 percent support that effort, and 40 percent want U.S. troops out of Iraq as soon as possible, even if Iraq is not completely stable. Support for staying the course as Iraq achieves stability has increased nine points in the past month. The public does not foresee greater danger to Iraqis after the handover. 59 percent think Iraqis will be just as safe as they were before the transfer of power, and 16 percent think they will be safer. One in five predicts they will be less safe. Polls conducted over the past few months have shown that Americans are discouraged about U.S. progress in Iraq, and this poll continues that trend; most Americans believe U.S. efforts to bring stability and order to Iraq are not going well. 57 percent think things are going badly for U.S. efforts in Iraq, while 40 percent think things are going well. The public is far more pessimistic than it was a year ago, when 60 percent thought the U.S. was doing well in Iraq. Americans are divided as to whether the United States did the right thing by taking military action against Iraq; 48 percent think it was the right thing to do, and an almost equal number think it was not. Opinions have been similarly divided since April, when violence and terrorism in Iraq escalated. DID U.S. DO RIGHT THING IN IRAQ? Americans' views of the appropriateness of U.S. action against Iraq were more positive throughout most of 2003; then, by about two to one, the public felt invading Iraq was the right thing to do. Evidence of the decreased enthusiasm for the war can also be found in the widespread view that the war has not been worth its costs. 60 percent think it was not worth the loss of life and other costs of the war, while 32 percent think it was. Views on this question have also been consistent since last April. But since CBS News began asking this question in July, 2003, most Americans have not felt this war was worth its costs. Almost a year ago, Americans were divided, 45 percent felt it was, while 45 percent felt it was not. At least part of the reason Americans are not more supportive of the war likely is the skepticism about whether the war has helped America's efforts against terrorism. In fact, a sizable segment of the public sees the war in Iraq as exacerbating the threat of terrorism against the U.S. 47 percent think the threat of terrorism against the U.S. has increased as a result of the war, and only 13 percent think it has decreased. 38 percent think it has had no effect. EFFECT OF WAR IN IRAQ ON TERRORISM AGAINST U.S. The past year has shown a growing number of Americans convinced that the war has increased the threat of terrorism against the U.S. In May 2003, 34 percent felt the war had increased the terrorist threat. More than half believe that U.S. action against Iraq has actually had the opposite of its intended effect by fomenting anti-U.S. terrorism. 55 percent think the war has created more terrorists who are planning to attack the U.S., and only 17 percent think it has eliminated terrorists. 44 percent of the public sees no tie at all between the war in Iraq and the war on terror, while half thinks the war in Iraq is at least a minor part of the broader war against terrorism. 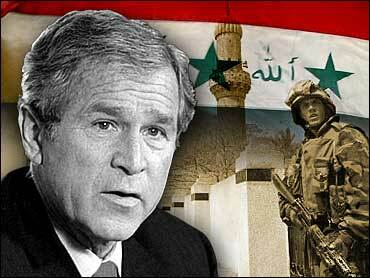 IS WAR IN IRAQ PART OF WAR ON TERRORISM? Just after the war began, more Americans were convinced that the war was part of efforts to combat terrorism. In April 2003, 53 percent thought it was a major part of the war on terrorism, and 13 percent thought it was a minor part. However, 41 percent still think Saddam Hussein was personally involved in the 9/11 attacks, but slightly more -- 46 percent -- think he was not. WAS SADDAM INVOLVED IN 9/11 ATTACKS? More Americans were convinced of his involvement earlier in the war. In April 2003, just over half believed Saddam was involved in the 9/11 attacks. But in other 2004 polls, that figure was below 50 percent. Did Saddam have ties to al Qaeda? 45 percent think Saddam was working with al Qaeda prior to the war against Iraq, but still a sizable number -- 38 percent -- think he was not, and nearly one in five aren't sure. WAS SADDAM WORKING WITH AL QAEDA? Views on Iraq and Saddam's ties to terrorism are related to support for the war. Those who think Saddam had ties to al Qaeda, or was involved in the 9/11 attacks, are more likely to think invading Iraq was the right thing to do. Americans are divided over how they think Iraqis view the U.S. Now, 40 percent think Iraqis are feeling grateful to the U.S. for removing Saddam Hussein from power, but slightly more -- 43 percent -- think the Iraqis are resentful of the U.S. for being in Iraq. Since April 2003, the belief that Iraqis were grateful to the U.S. has never been widely held, although it was more prevalent a year ago. HOW DO IRAQIS FEEL ABOUT U.S.? President George W. Bush receives mostly negative evaluations from the public in this poll, both overall and for his handling of Iraq. His overall job approval rating is 42 percent, near his last month's low of 41 percent, and just 36 percent approve of his handling of the war in Iraq. On both measures, far more disapprove. Bush receives higher marks on handling the campaign against terrorism, historically one of his strengths. Bush's evaluation on Iraq turned negative as the situation there worsened, but it may also have declined because most Americans think he has been less than forthright about Iraq; only 18 percent believe he has told the public the entire truth. 59 percent think Bush has been mostly telling the truth but also hiding something, and another one in five thinks he has been mostly lying about it. The Bush Administration receives similar criticism for its handling of the events at Abu Ghraib prison. 52 percent think members of the administration have been hiding information about the treatment of prisoners there, and another 27 percent think they are mostly lying. Only 15 percent think they have told the entire truth about the prison abuse. This poll was conducted among a nationwide random sample of 1,053 adults interviewed by telephone June 23-27, 2004. The error due to sampling could be plus or minus three percentage points for results based on the entire sample. The error for subgroups may be higher.For detailed information on how CBS News conducts public opinion surveys, click here.